Ian McLagan was a genuine, dyed-in-the-wool rock’n’roller. In fact, his smiling visage — he was, after all, a member of the Small Faces and the Faces — would serve as an ideal illustration in the proverbial Dictionary Of What Is Truly Cool. The man known to his many mates and even more fans and admirers as ‘Mac’ was the sort who shrugged off such puffery. And then he just carried on creating splendid and genuine rock’n’roll with his Bump Band as well as musically aid and abet a marquee line-up of truly blue ribbon talent that he toured and recorded with: The Rolling Stones, Bob Dylan, Bonnie Raitt, Bruce Springsteen, Taj Mahal, John Hiatt, David Lindley, Paul Westerberg, Billy Bragg and Patty Griffin, to name some but hardly all of the notables that McLagan worked with over his four-plus decade career. McLagan entered the music game in Swinging London in the mid-1960s, and you can read all about it in his vivid and delightful memoir, ‘All The Rage,’ a book that The Express hailed as “One of the best music books in years.” He ascended from the Top of the Pops with Small Faces to the pinnacle of rock with the Faces when Rod Stewart and Ron Wood joined the band. The rollicking Faces ruled 1970s album radio and sales charts as well as the stadiums, arenas and festivals around the world, leaving countless satisfied fans, many wild tales and more than a few quivering hotel managers in their wake. Whether McLagan was singing, writing and playing his own music or as the go-to guy for a session or tour, he was and remains the quintessence of rock’n’roll. In 2006, he released a touching tribute to his old bandmate, ‘Spiritual Boy: An Appreciation Of Ronnie Lane,’ acclaimed by the Dallas Observer as “a warm and fitting salute to one of rock’s sadly unsung master songwriters and a must-have disc.” Spiritual Boy has garnered chart success in Mojo and leaves a trail of glowing reviews in Rolling Stone, No Depression, Uncut, and Goldmine. 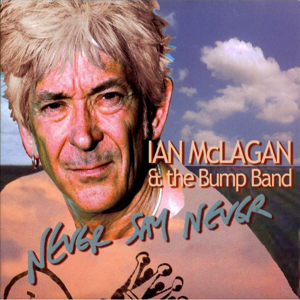 Awarded the prestigious Ivor Novello Award in 1996 for his outstanding contributions to British music and inducted into the Texas Music Hall of Fame in 2004, McLagan was beloved by musicians and music lovers alike. He produced the Faces four CD boxed set, ‘Five Guys Walk Into A Bar...’ for Rhino Records, and received a rare honor on April 6th, 2006, when it was proclaimed Ian ‘Mac’ McLagan Day in Austin Texas. But rather than rest on his laurels, Ian McLagan continued to do what he always did best: rock’n’roll. In December of 2007 Ian ‘Mac’ McLagan and Glyn Johns, his old pal from Small Faces and Faces days, met at Sphere Studios in London to mix and master Ian McLagan’s beautiful and emotionally raw CD, ‘Never Say Never.’ The self produced and directed album features McLagan’s award winning Bump Band: ‘Scrappy’ Jud Newcomb, Don Harvey and Mark Andes and includes all original songs written by one of the best-loved musicians of our time. Patty Griffin graces ‘Never Say Never’ with her soulful vocals and she and the Tosca Strings can be heard on the final track, the heart wrenching ‘When The Crying Is Over.’ McLagan recorded and produced ‘Never Say Never’ at The Doghouse Studios in Manor, Texas, and recorded ‘Where Angels Hide’ on the Steinway in The Edythe Bates Old Chapel at The International Festival-Institute in Round Top, Texas. Ian McLagan sadly passed away aged 69 on December 3 2014, surrounded by family and friends in his adopted hometown of Austin, Texas.